It’s hard to imagine anyone achieving such dizzying career success with as little tabloid, television and papparazzi fanfare as Neil Diamond has had. 57 singles on the pop charts over a 20 year span. 55+ singles on the adult contemporary charts over a 40 year span. Has sold over 120,000,000 records. #1 live album of all time by an Adult Contemporary artist, Hot August Night. That same album ranked #1 on the Australian charts for 29 consecutive weeks. It seems the only thing Neil Diamond fans can’t figure out is whether he should be heralded for his skills as a songwriter or as a performer. Legend has it that Neil was a Brill Building songwriter, toiling alongside Gerry Goffin and Carole King, Ellie Greenwich and Jeff Barry, Barry Mann and Cynthia Weil, and so on. When “I’m A Believer” was lauded as Pop Song of the Year for the Monkees in 1966, his reputation as a great songwriter was born. Elvis recorded a phenomenal version of “And the Grass Won’t Pay No Mind.” UB40 hit #1 in the mid 1980s with “Red Red Wine.” So naturally this legend had legs…when in fact, Diamond was writing these songs to establish his own singing career. Although he worked in the Brill Building during the 1960s, he wasn’t a pure “songwriter” in the same sense as the others. He had signed a recording contract in the early 1960s, but was dumped when the single failed to chart. With the 1966 success of “I’m a Believer,” Diamond signed with BANG Records, an offshoot of Atlantic Records. He immediately scored with “Solitary Man,” “Kentucky Woman,” and “Cherry, Cherry.” A few more hits followed in the late 1960s until 1969’s “Sweet Caroline” launched Neil into the stratosphere of popular song. “Cracklin’Rosie,” “I Am…I Said,” and the monstrous “Song Sung Blue” followed in consecutive years. An album recorded in 1972 captures Neil Diamond at his artistic and performing peak: Hot August Night. It’s a must-have for Neil Diamond fans, and arguably the most significant live recording of popular song from the past century. Few performers have ever commanded the musical stage the way Diamond did during the 1970s, and this album captures it. More importantly, it answers the question: Neil Diamond is more significant as artist than songwriter. But you probably know all that stuff. So let’s focus on two recordings that are often overlooked in the Neil Diamond catalog. While both were huge sellers at the time, they were somewhat dismissed by critics as “overdone” or “overblown.” Diamond was thought by some to be too self-absorbed in his music; too impressed with his own importance. In retrospect, both albums have held up nicely. While other recordings of the era have fallen by the wayside or simply sound dated, these have improved with age and manage to sound just as “current” more than 30 years after the fact. Where Diamond began his career with memories of his urban upbringing such as “Brooklyn Roads” and “Shiloh,” he returns to the city-as-muse as an established artist on this 1976 offering. Unlike the disconnected youth of “Brooklyn Roads,” Diamond celebrates city life as an adult observer, with the recurring idea that the city is a source of energy to be tapped. The album features two prototypical Diamond power ballads, “Lady Oh” and the hit “If You Know What I Mean.” “Lady Oh” might be the better musically, but lyrically doesn’t hold up to the innocence-lost memories conjured by the latter. Both are outstanding vocal performances. Other numbers are mostly forgotten album tracks, but honestly, there isn’t a clunker in the bunch. “Stargazer” is the dreamer trying to find fame. “Don’t Think, Feel” was a minor hit with a solid reggae sound. “Signs” and “Home is a Wounded Heart” are also strong songs. As mentioned above, Beautiful Noise met with mixed reviews when it was released. It was produced by Robbie Robertson, musical savant from The Band. Some Diamond fans didn’t like the urgency of this record, and blamed Robertson. Some Robertson fans didn’t like the fact that The Band was fragmenting, and blamed Diamond. Some critics thought it was a marriage of opportunists looking to expand their musical horizons. Regardless, the album sold quite well and was generally regarded as a good Neil Diamond record. With 20/20 hindsight, it is apparent more that 30 years later that this was a great album, it is extremely easy to listen to without being bland, and has none of the dull tunes of Diamond’s later albums that have you pushing the eject button and rummaging around for the greatest hits CD. It’s an effort both Diamond and Robertson can be proud of, probably not equalled by Neil until his Tennessee Moon album 20 years later. Question: Name Neil Diamond’s Grammy Award winning soundtrack album created for a big-budget movie adapted from a wildly popular novel. Although certified gold at one time, the album is more or less forgotten or surprisingly unknown by most of his fan base. It was so complex and hard to understand that, naturally, it won a Grammy Award. Within a year or two it had vanished from the record stores. In the years since Jonathan Livingston Seagull, Diamond cranked out a string of Diamond-esque songs. “Longfellow Serenade” followed a year later, and and his foray into deep meaningful gibberish was forgiven and forgotten. Songs like “Desiree” and “Forever in Blue Jeans” and “September Morn” would satisfy fans for years to come. Imagine for a moment if Diamond hadn’t released JLS in 1973. It wouldn’t be missed. His career would’ve been just as successful, concerts still would’ve sold out, his popularity undiminished. Now imagine that the album were released today. With his massive hits firmly entrenched in the annals of popular song, fans have plenty to fall back on and are no longer desperate for the next Neil Diamond song. Jonathan Livingston Seagull just might be regarded as a landmark achievement. I submit to you that if it were released today — without the wacky booklet and introspective ramblings — critics would call it a magnum opus. A musical exclamation point on a spectacular career. Unfortunately, this is all conjecture. Fortunately, it doesn’t matter…there’s a classic Neil Diamond out there, waiting to be discovered. Or re-discovered, considering its meteoric one-time success. No, skip that. 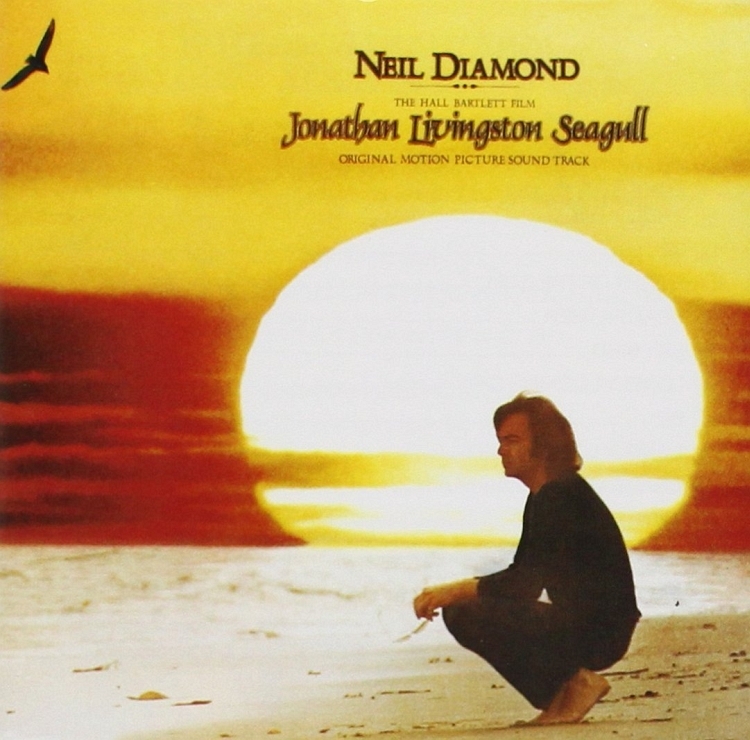 Neil fans never really did “discover” Jonathan Livingston Seagull, no matter how cool the cover photo looked. It’s a musical journey that was way ahead of its time. It’s a very un-Neil-like record. It will take you on a soaring journey, most of it without lyrics. It’s Jonathan Livingston Seagull, Neil’s best unknown Grammy-winning million seller.